It’s been well over a century since Barbarulo first opened its doors, but the brand is still run by the same family of master jewellers while retaining its deep-seated connection to Naples. 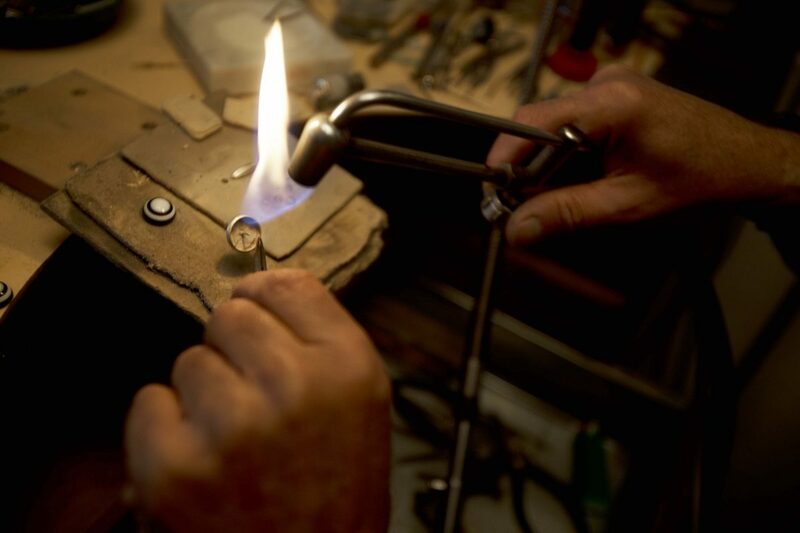 Each item of Barbarulo jewellery is still made entirely by hand, and is the product of over 100 years of uniquely skilled craftsmanship. “The history of the Barbarulo family has always been linked to the world of jewellery,” Cristiano Barbarulo – the fourth in an illustrious line of master jewellers – tells us. And what a history it has been. Indeed, the brand’s full name, Barbarulo Napoli 1894, alludes to the two key ingredients that, throughout its colourful history, have made this brand the world-renowned label it is today: time and place. Firstly, to time. “The year 1894 is the oldest and most certain date documented by an act of marriage of my great-grandfather, Raffaele Barbarulo, who was a goldsmith in the province of Naples at that time," explains Cristiano. Of course, that date should not be taken as the sudden genesis of the brand out of nowhere; it is merely the first verifiable recording of a skillset and an approach to jewellery that had likely been gradually cultivated since even further back in time. More such documented signs would soon follow: there are grainy photographs of the first Barbarulo store dated to the early 1900s that mark the brand’s transition from a trusted local artisanal shop into a culturally important jewellery store, which more than merited the attention of the Neapolitan beau monde. Amedeo Barbarulo, son of Raffaele and grandfather to Cristiano, was the brains behind the expansion, responsible for bringing his own father’s craft to a wider audience without compromising on the quality of his products. And what of place? Naples, as well as being home to all four generations of the family, is where the first Barbarulo shop was opened, in the city’s old town, back at the turn of the 20th century. “Naples was the capital of the Kingdom of the Two Sicilies. Today we are the capital of the world for style and elegance.” The history of Barbarulo is the history of the interaction between over a century of jewellery-making experience and the stunning cityscape of Naples. And of course, its inhabitants, whose style Cristiano can express in just three words: “elegant, creative and essential”. Still, despite this unprecedented global renown, the brand remains Neapolitan through and through. “Our jewels are in harmony with the Neapolitan style. They are not eccentric or exasperatedly luxurious. They are harmonious in form and size. They are sober and elegant and sometimes they can also be witty and funny but always preserving the style and the care of beauty.” Yet the cufflink itself – Barbarulo’s main offering – is not a particularly Neapolitan product. How does Cristiano answer to that? “Cufflinks were born in England, it is true. But in Italy we have many landmarks concerning culture and art. The city of Naples is a world reference for having the best tailors in the world. Barbarulo cufflinks are perfect on a bespoke suit made in Naples.” Cristiano never loses sight of the bigger picture; his cufflinks are designed to fit seamlessly into an elegant tailoring ensemble. The Barbarulo gentleman is, therefore, “a person who loves beauty and Italian style. He loves to stand out through details and is looking for originality and often exclusivity. He believes that beauty can save the world. He loves Italy for the traditions of its land, culture and art.” Just as a pair of Barbarulo cufflinks will fit into a larger outfit, so their wearer can envision his place in a broader history of style and culture, a history in which Barbarulo has played a major part. This embeddedness requires a thorough command of subtlety and sophistication. After all, “it’s always the small details that make the big difference.” And the reward? “Women know how to appreciate men who wear cufflinks,” Cristiano assures us. It’s clear then, that while the skills that make Barbarulo what it is have been passed down through over one hundred years of patrilineage, this Neapolitan brand is far from going stale. Rather it has combined its generations of expertise with a keen eye for the new and exciting. The results are nothing short of beautiful and will look good any time, any place. (Though for the sake of giving the cufflinks the audience they deserve, we suggest wearing to formal events with your best suiting). 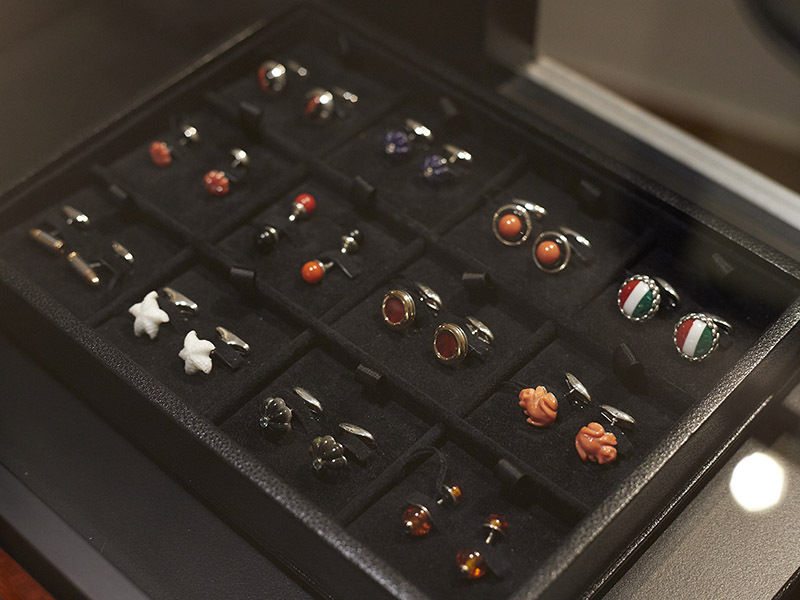 An array of Barbarulo cufflinks in various shapes, colours and materials, set out neatly in a black display case.